Only Hanova can guarantee you 100% sealing with its patented closure! – Paper / PE: This complex product is impermeable to meat or deli juices and perfectly adapted to the transportation and preservation of fresh or prepared products. – BIPE : Mainly assembled at our production site, this specific complex product was developed especially for transportation, preservation, freezing and defrosting of fish. 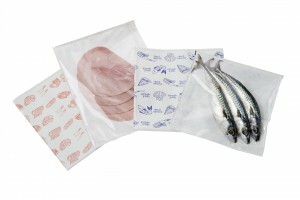 Its 100% barrier effect is used to contain strong smells and to preserve the taste of seafood products. There are many possibilities to customise it, consult with us! Polyester, polypro or aluminium complex. Possible to manufacture with transparent film on one side. Printing of up to 6 colours.